Samsung’s website claims that the company’s 18-200mm superzoom lens is capable of covering everything from arena sports to mountain vistas. This is a big ambition but Samsung has stacked the odds in its favour by packing a lot of technology into its zoom lens, including two extra-low dispersion elements and three aspherical profiles to control aberrations. Equally important is the fact that the lens has been optimised for video use through the deployment of an ultra-quiet Voice Coil Motor AF drive system. Unusually in an age of over-ambitious claims, Samsung probably under-sells the success of its AF drive, describing the mechanism as ‘whisper quiet’ when ‘virtually silent’ might be a fairer measure. The lens is substantial but does not look out of place on a Compact System Camera body (a Samsung NX11 model in the case of this review). 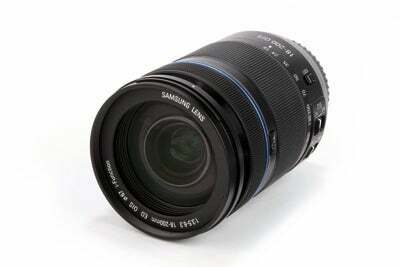 There is a broad zoom ring that extends rearwards of the centre of the lens and a narrower focusing ring at its front. The zoom ring has a convenient 90° throw but is perhaps just a bit on the heavy side – the focusing ring is much lighter and more comfortable to use. There is no movement of the focusing ring in AF mode. Samsung’s signature i-Function button is located between the two rings and turns the focusing ring into an adjustment control that can be used to vary the aperture setting, exposure time, exposure compensation, white balance and exposure sensitivity (ISO). focal length. The maximum aperture is only modest, falling from f/3.5 at 18mm to f/6.3 from 120mm through to 200mm. In terms of exposure times, this limitation is addressed through the incorporation of Samsung’s Optical Image Stabilisation (OIS) technology but there is no escaping the fact that the lack of wider aperture settings restricts the use of selective focusing techniques. Technical testing revealed that sharpness is generally less at maximum aperture but closing down by one f-stop is sufficient to take the zoom’s MTF figures above the critical 0.25 cycles-per-pixel threshold except at 200mm, when the lens just narrowly fails to hit this level. It is worth noting (and applauding the fact) that Samsung restricts the minimum aperture to f/22 regardless of the focal-length setting used. The highest MTF figures generally correspond with f/8-11, which is a commonly used aperture range for a wide range of picture-taking situations. There are clear signs of chromatic aberration at both minimum and maximum focal-length on high-contrast test-target images. Slight colour fringing can also be detected at the extreme edges of some real-world pictures but the problem is likely to pass unnoticed by most viewers when the images are inspected as complete pictures, rather than at pixel level. Overall this proves to be a very capable lens thanks to an amazingly wide zoom range and optical image stabilisation, with image quality generally good or better than good. At £700, Samsung’s 18-200mm superzoom is on the expensive side but it is also a very versatile and easy-to-use package that genuinely has the potential to be the only lens some photographers will ever need to buy.